Sometimes you get surprised. It happened to me today and I thought I'd note it down to see if anyone else has noticed the phenomenon. Like many people, I use a music sequencer/DAW/host software/MIDI and Audio sequencer as a way of turning ideas into music. I tend to use the native file format of the software, because that usually has the most comprehensive support of all the features of that particular (I'll say 'sequencer' and show my age - I was raised in a time when little red lights flashed along sequencers on stage behind people like Edgar Froese or Keith Emerson) sequencer. This is just like the way that a very popular document format is the .doc format, used by Microsoft's 'Word' word processor. At the back of my mind, there has always been the implicit assumption that if I needed to export the music, then apart from the obvious MP3 and FLAC (or even WAV) audio forms, I would use a MIDI File. Having used and/or reviewed The Music System and Ample on the BBC B Micro, C-Lab's Notator (now Apple Logic and on the Mac), Steinberg's Cubase (now a company within the Yamaha group), Trackman, Dr. T's KCS and Intelligent Music's RealTime (possibly my all-time favourite MIDI sequencer!) on Atari STs, and Pro Tools, Bill Southworth and compny's Total Music, Opcode's Studio Vision, MOTU's Performer, Intelligent Music's M, etc on the Mac, plus a few others, then I knew that you could almost always also save as a MIDI File (.mid these days, although I remember the .smf 'smurf' suffix also being used in the days of floppy disks). The shock came when I discovered that whilst MIDI File import is alive and well (in most cases: one 'you know who you are' sequencer I downloaded and tried today would not import MIDI Files at all!) the reverse is not necessarily true. Apple's Garageband is one example where you can't export a MIDI File, although apparently you can import the Garageband file into Logic and then export it as a MIDI File. 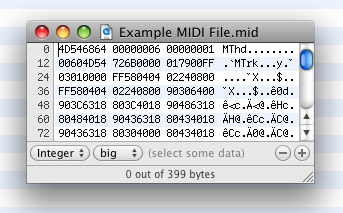 Even my current favourite, Ableton Live, only exports MIDI Files of individual phrase clips, and not complete songs. In many cases, trying to find out exactly what the MIDI File capabilities of a specific piece of music software were was not easy. It seems that some people expect you to buy and then find out, which is a little sub-optimal for me. My preference is to have the manual downloadable (or browsable on-line) so that I can find out before I buy. I'm very tempted to compile a table of the Import/Export capabilities of 'sequencers', so if anyone has any information, I'd be happy to collate it here!